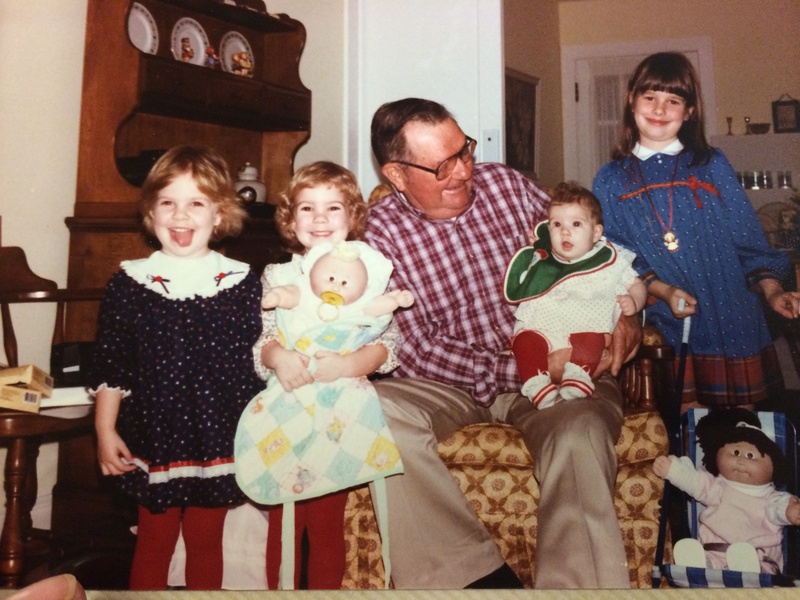 The author and family, enjoying the original Cabbage Patch Kids. circa 1984 or so. Melissa brought it up, all casual like. I don’t remember the context, but she mentioned, “Babyland General.” She said it like I would know what it was. Like it was the mall. “What’s that?” I asked, not really that interested. It sounded like a baby supply superstore. As a rule, I don’t love baby supply stores. At that moment, I was concerned she might make me go to one with her. “The Cabbage Patch place,” she told me. Her tone suggested I’d forgotten something as basic as a birthday. And now she had my undivided attention. And then she explained. And it turns out Babyland General is where you shop for babies, not where you shop FOR babies. “So is it like a factory tour?” I questioned, not quite getting it when she told me it’s where Cabbage Patch Kids are made. No, no, no, no, she laughed. Cabbage Patch Kids are born, not made. And then, because I stared at her with my mouth and eyes round as marbles, she told me everything. 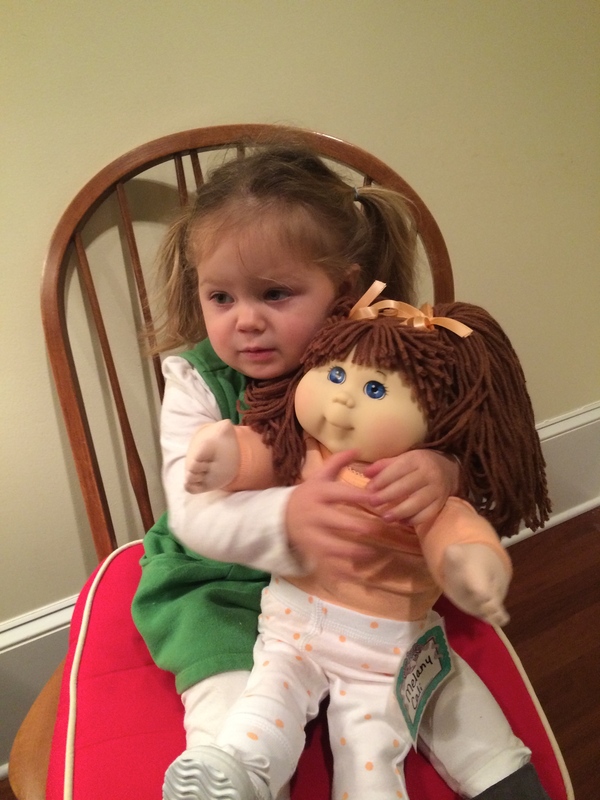 Most of us buy our Cabbage Patch Kids at toy stores. Children in Georgia adopt them from Babyland General, this actually real hospital devoted to the birthing of cloth dolls with plastic faces. Their parents drive them out to Cleveland, GA, where there is not much else going on, so they can view the delivery of their dolls from the loins of Mother Cabbage. Who sits at the base of a magical lighted tree. That has pixie-esque BunnyBees dangling from it, impregnating the cabbages with gender crystals. 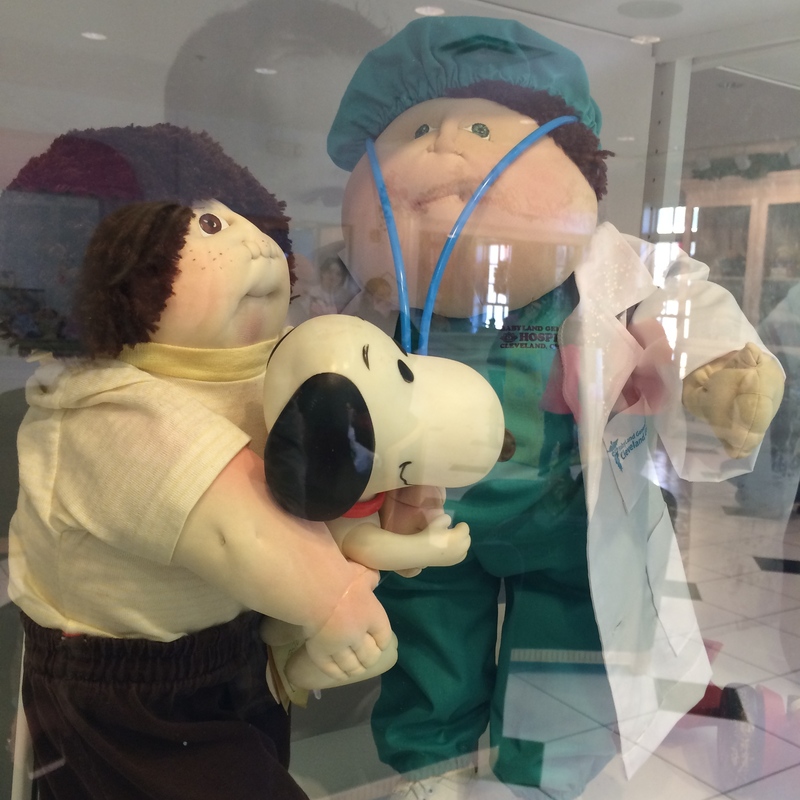 And upon following a viewing of the miracle of Cabbage Patch life, our sweet Georgia brethren sign adoption papers with a nurse or doctor on staff. They take oaths to care for their cabbage babies forever, an oath it appears almost none of them have taken seriously into adulthood. I’ve been to their homes. I see only the rare Cabbage Kid. The doctors and nurses wear scrubs, by the way. “WHAT.” I replied to her staggering description. “Oh, yes,” she said, still viewing me like I missed a step on the stairs. “Yes!” she repeated, starting to take some great delight in my wide-eyed questions. I couldn’t quite believe it. No one who grew up in the days of Cabbage Patch mania hears of Babyland General as an adult and believes it. It sounds like some acid trip fever dream yanked from the fuzzy-edged days of our childhood. I insisted that we visit, and Melissa acquiesced readily. 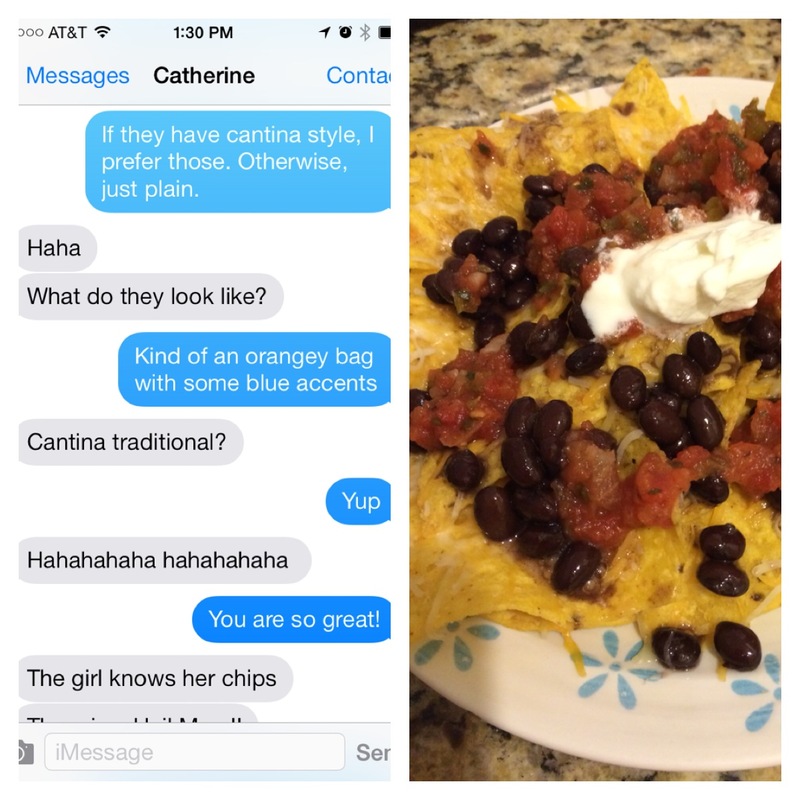 A quick survey of other friends born and raised in Georgia confirmed her incredulity that I’d never heard of it. They’ve all been. More than once. This is, to them, how you get a Cabbage Patch Kid. And all of them acted like it was completely normal and not bizarre. Well, that’s not totally true. Some of them do laugh and say, “Yeah, I guess it’s kind of weird.” But, they’re all pretty matter of fact about it. It’s like they thought every state had a Babyland General. I suppose this is like when I left Louisiana and realized nobody else got a week’s vacation from school for Mardi Gras. 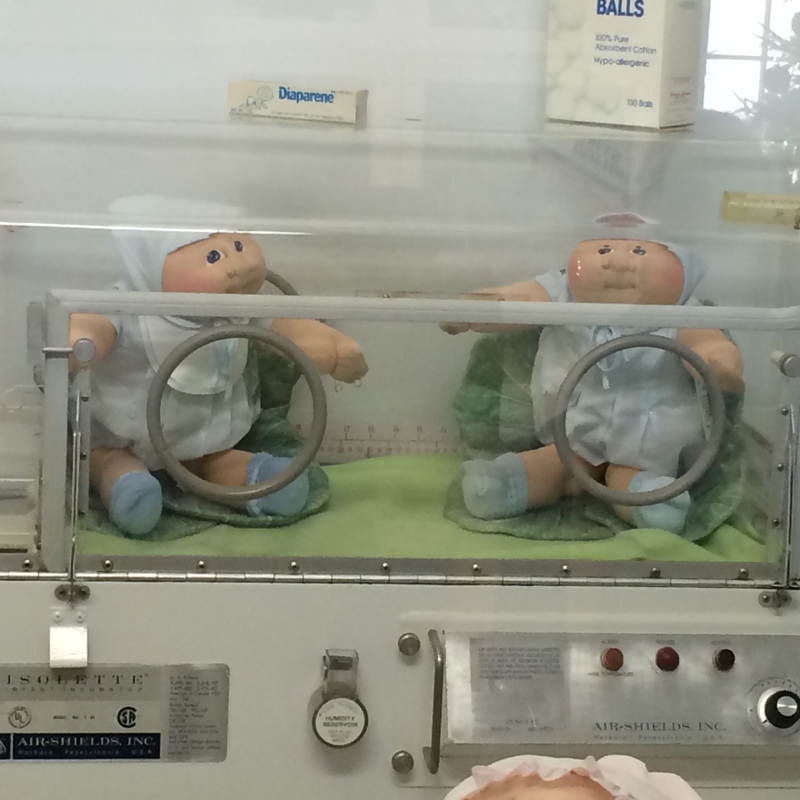 Except with Babyland General, there are animatronic babies. Animatronic. Babies. We waited a year for our trip so that Melissa’s daughter would be old enough to enjoy the experience. 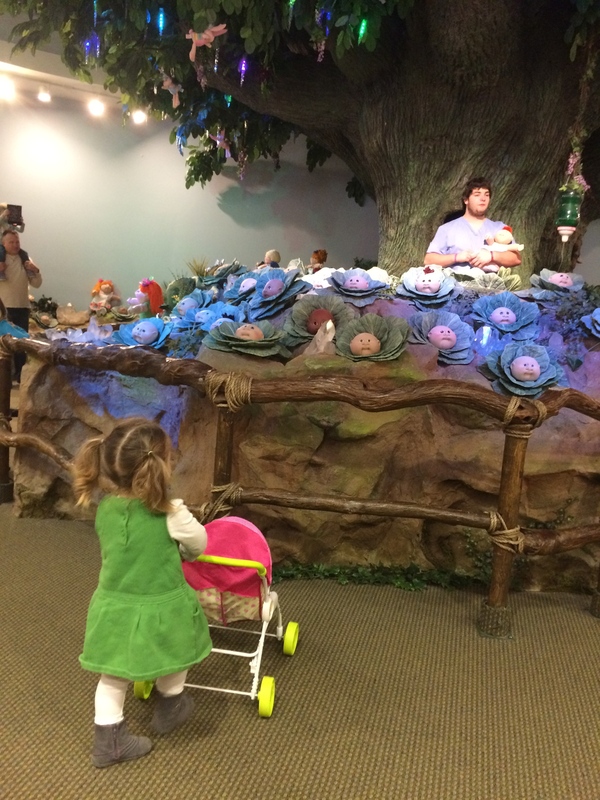 Not that we needed a reason to visit the Cabbage Patch mecca, but having a small child along legitimized our adventure. I suspected it would be cruel to just go there and snark. Children really do love it, and I didn’t want to be that smirking adult slinking around with a cell phone camera. Even though I kind of did that anyway. But I did it with reverence. Like a Catholic calling the Pope “Frankie” with fondness in her or her voice. The sign that greets you. I would argue the stork is misleading. As you will soon see. Babyland General in its current incarnation, which I’m told is an upgrade from its original location in a smaller venue, looks like a grand estate. 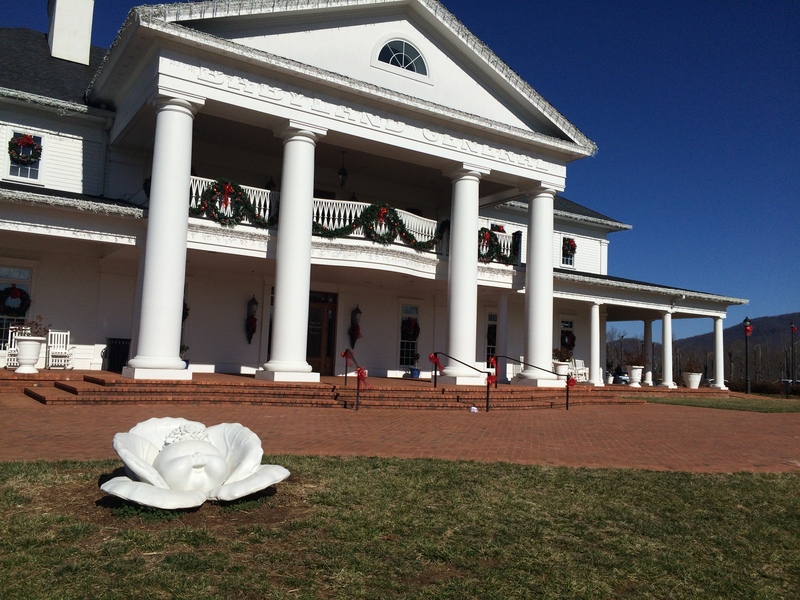 The pillared white mansion with the wrap-around porch sits atop a gently sloping green hill. If not for the massive sculptures of baby heads nestled in cabbage leaves, you might expect to see Civil War re-enactors mustering over the hill. Babyland General, still decorated for the holidays. As children of the 80s, we’ve seen the baby-in-a-cabbage image all our lives and never questioned it. But have you ever stopped to think about the science or the logistics involved? Is there a fully formed body under the ground, growing like a potato? What happens when it rains? Is there great tragedy in a flood? 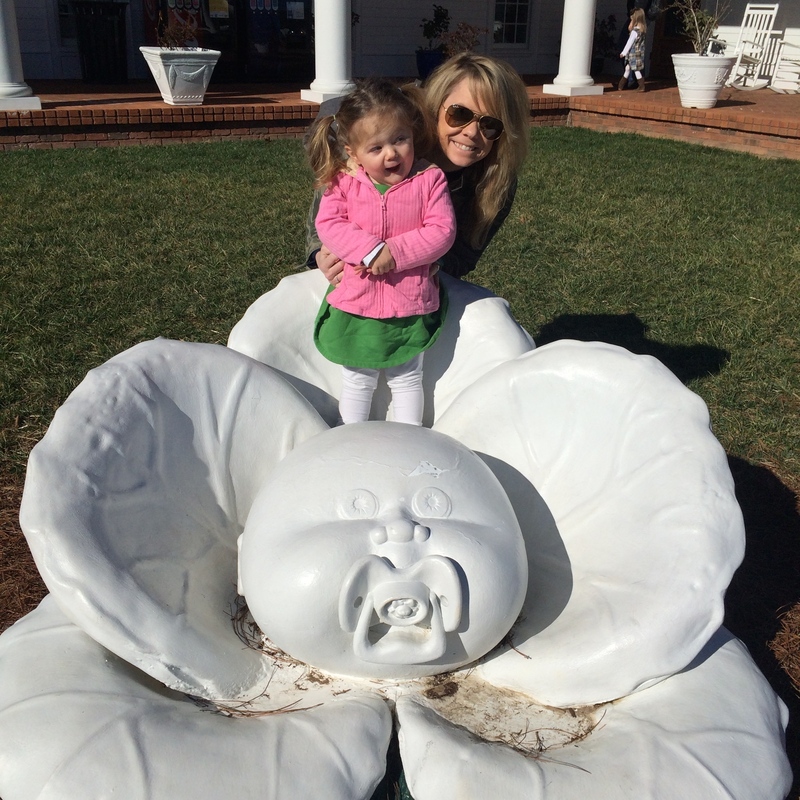 Melissa and her daughter and a giant baby head in a cabbage. 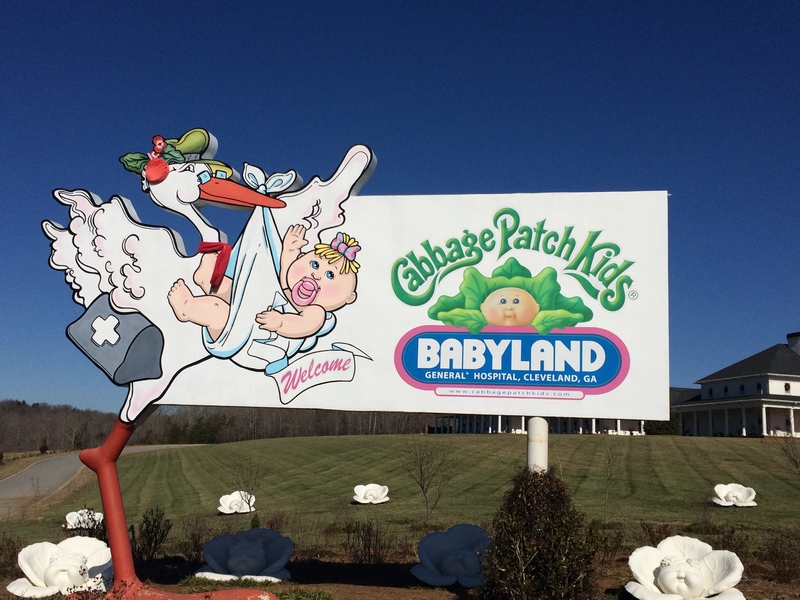 You can’t worry about these adult-minded issues for too long at Babyland General. 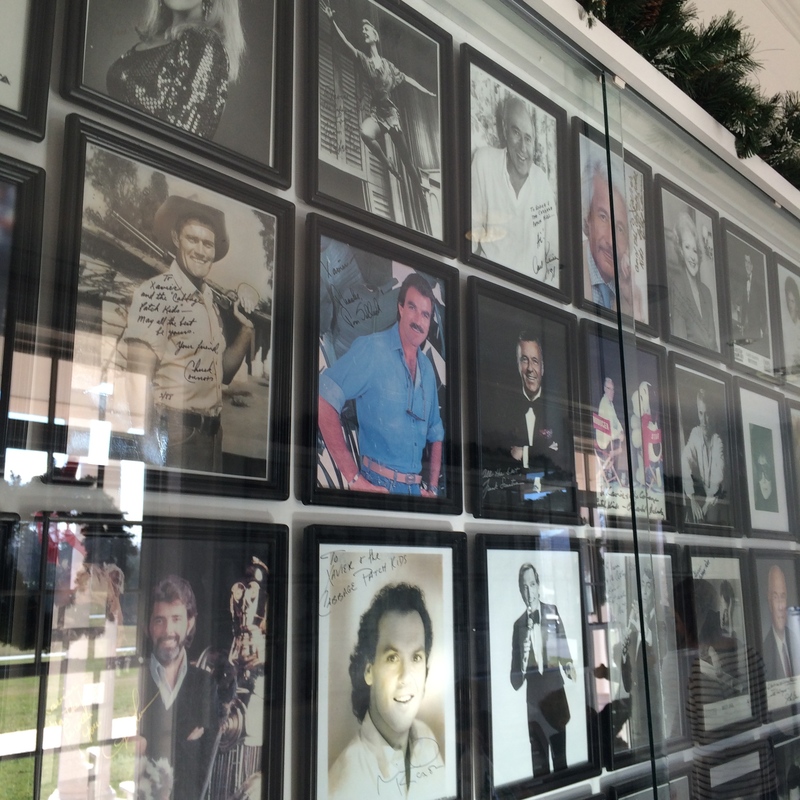 Once inside, you’re greeted by the many faces of previous celebrity visitors- Whoopi Goldberg, Tom Selleck, and Michael Keaton, to name a few. I wonder how many of them used their status to scoop up a handful of hard-to-find Kids for their children and nieces/nephews in the 80s. Mary Martin is in there too. It’s like a bunch of People Magazine covers from the 80s. Once you’re past this hall of fame, there’s an actual admissions desk where you actually sign in with a nurse in a white cap. Admission is free, but they’re building an illusion here. At our visit, we also spotted a Santa statue holding out an arm to welcome children into his lap. Melissa’s daughter seemed most interested in this, having just experienced the cognitive dissonance of befriending an old stranger and getting gifts in return at Christmas. She climbed right on to his lap, like an old pro, and seemed a little befuddled when he pulled her away. She’s the only one I saw posing in this box that actually fit inside it. After the nurse’s desk, we found cases filled with some of the original hand-stitched dolls crafted by Xavier Roberts, and they look like they might come alive in the night and gum you with their colorless lips. Melissa and I viewed them with wrinkled foreheads and cringes. Melissa’s daughter angrily tried to pry open the locked cabinets with her toddler fingers and made shrieky little growls of annoyance that she couldn’t get to these creatures of horror. I guess we don’t get a sense of which dolls will kill us until we’re in middle school. Wonder if the Peanuts people know about this. 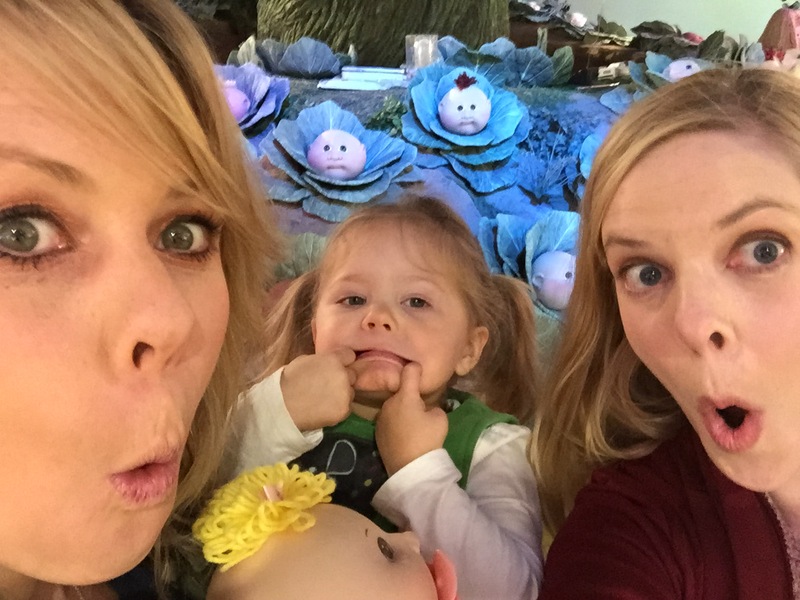 We hustled her into the next series of rooms: the nurseries. The nurseries contain the limited-edition dolls. These are not the dolls you buy your two-year old to love to life like a Velveteen Rabbit. Collectors salivate over these hand-stitched dolls with that characteristic nose and hidden lower lip. Melissa’s daughter didn’t get the memo that these dolls are worth more than my monthly cable bill, and she carelessly scooped up low-hanging babies and dragged them from one nursery room to another. The staff at Babyland General would never shatter the illusion by tsking at her and making her stop. I imagine there’s some poor underling nurse who has to scurry into the nursery rooms to straighten them every time a toddler blusters through like a sticky hurricane. Remember how we all wanted preemies? And now that you know people with actual preemies, it seems kind of sick, yeah? We finally made it to the main area, the big event, the delivery room. Against the back wall, we saw the centerpiece: the Magic Tree of Life. Or whatever they call it. Magic Crystal Tree, I think. All those little baby faces you see below? They move. They rotate like it’s The Exorcist. There’s constant whirring as robotic Cabbage Kids turn to eye their surroundings. 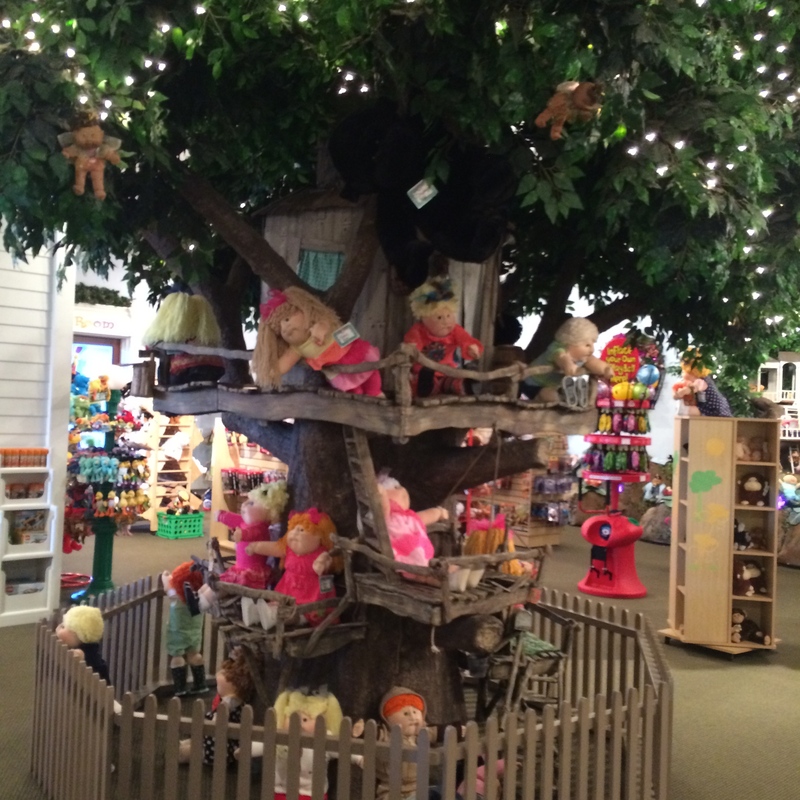 The BunnyBees hang from the trees to pollinate the Kids. I think a better story would be how they got bunnies and bees to crossbreed. About every half hour or so, they stage a live birth around the roots of the tree, but there’s plenty to do while you wait. And here is why Babyland General has no admission fee. As you’ve read this, though you might have some nostalgia for the Cabbage Patch Kids of your youth, you might also be questioning the popularity of Cabbage Patch Kids in the modern day. Sure, you’re going to have your rabid collectors and your curious spectators, but you’re probably wondering if there’s enough Cabbage Patch traction to justify a whole tourist destination. Oh, don’t worry. Babyland General thought of that. 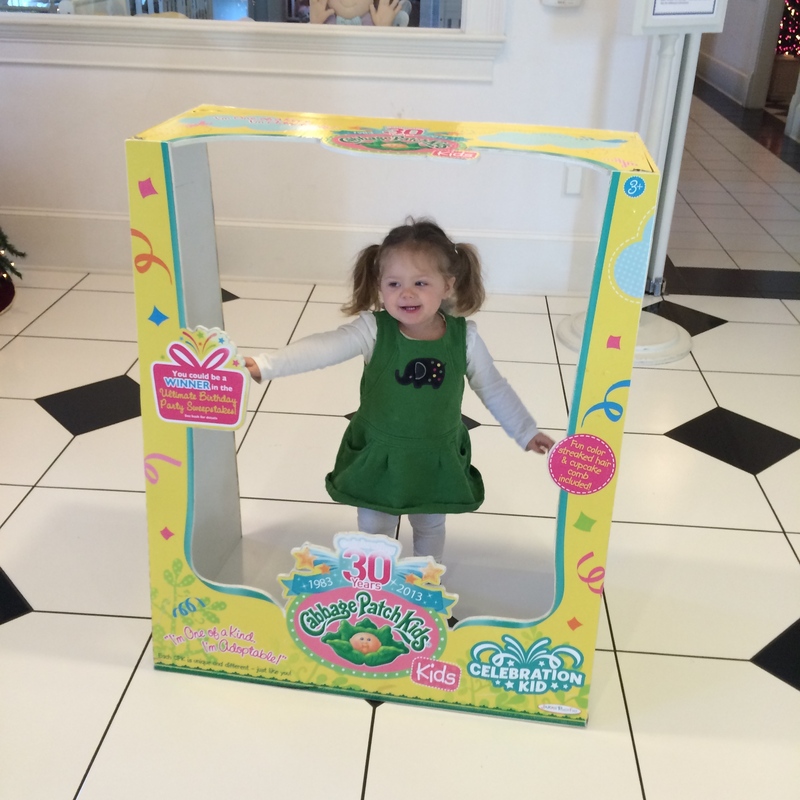 While you linger around waiting for the tree to have contractions, your waiting room is basically a toy store. Amidst the elaborately staged dolls in treehouses and newborns in cribs, you can find plenty of Cabbage Patch Kids and accessories. But you’ll also see My Little Pony, Sesame Street, those weird animals with bug eyes, puzzles, paper dolls, craft kits, and tons of stuffed animals. NOT a magic crystal tree. Just a basic treehouse tree. With baby fairies. Which no one ever explained. Her parents, clearly anticipating a golden afternoon adopting a Cabbage Patch Kid with their moppet in a dewy eyed rite of passage, told her the dog wasn’t for sale. The kid, I think, knew they were lying. But then a kindly nurse came over to talk to her about the impending birth of a brand new Cabbage Patch Kid. It’s one thing to pull a demon-child routine with your own parents, but it’s another to show your brat-face to a stranger in scrubs. The kid backed down. Meanwhile, Melissa’s daughter trailed around the toys, proving to be a questionable mother as she alternately hugged babies and then casually left them lying on the ground when a different baby presented itself. She gave her love indiscriminately and often while Melissa tried to determine which one of these dolls might be the one her daughter actually wanted to take home. And then came the big show, the main event, the moment of live cabbage birth. 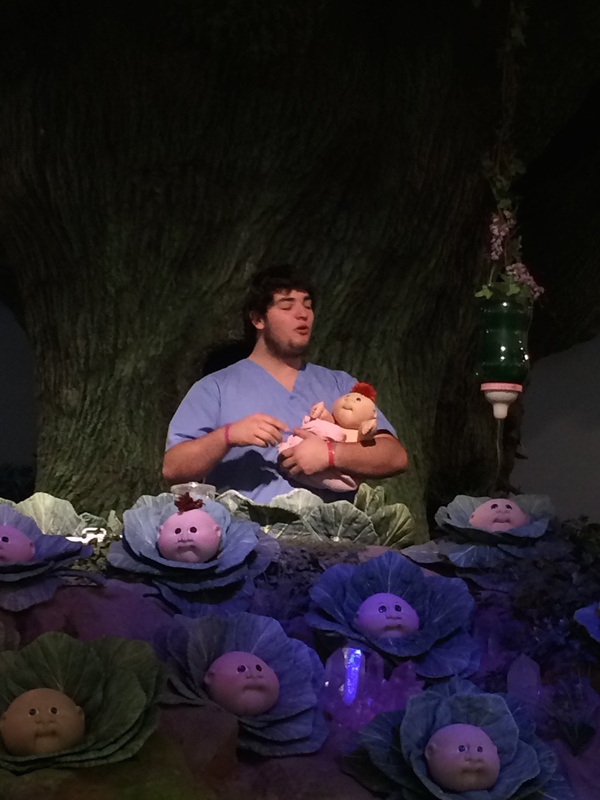 A young doctor, clearly someone who went into doll medicine for the money and not the passion, made his way to the tree and led us through a Cabbage Patch birth. I want to make a crack here about how his enthusiasm level suggested a high volume of pickleback shots the night before, but I worry someone from Babyland will some how read this and he’ll get in trouble for not being appropriately sincere and bouncy in his delivery, and I don’t want that. He did his job, okay? And the truth is, even when you work at a Magic Crystal Tree, work is still work, and we all have some where else we’d rather be. I saw Britney Spears in Vegas last year, and even she is just going through the motions for a paycheck. So let’s cut Dr. Cabbage some slack. Really, i bet this guy could tell you some good stories. I bet he’s met Tori Spelling. But still, let’s stop and marvel for a moment that this is HIS JOB. When he’s out with his buddies and they’re talking about work, he has to talk about cabbages giving birth. I really hope this kid is saving up for grad school or something. Maybe medical school for humans. – The BunnyBees that flutter over the patch impregnate the cabbages with pink or blue crystals that determine gender. I sense some interesting “birds and bees” talks in some parental futures. – A hole in the tree shows the Sonogram. That’s right. The tree grew with modern medical technology in it. – They check to make sure Mother Cabbage is, “a full 10 leaves dilated.” The doctor assures us this is normal and gives her a dose of Imagicillin to, “loosen up her leaves for the delivery.” The level of detail here is IMPRESSIVE. – And when Mother Cabbage at last expelled her baby (Do cabbages have muscles? What exactly was contracting? ), our friendly doctor finished his act by cutting the cord. Cutting. The. Cord. What do we think the Cord connected to exactly? OUR IMAGINATIONS? The doctor’s act really ends with a new baby wellness check-up in a glass windowed nursery, but I didn’t pay attention to that part. 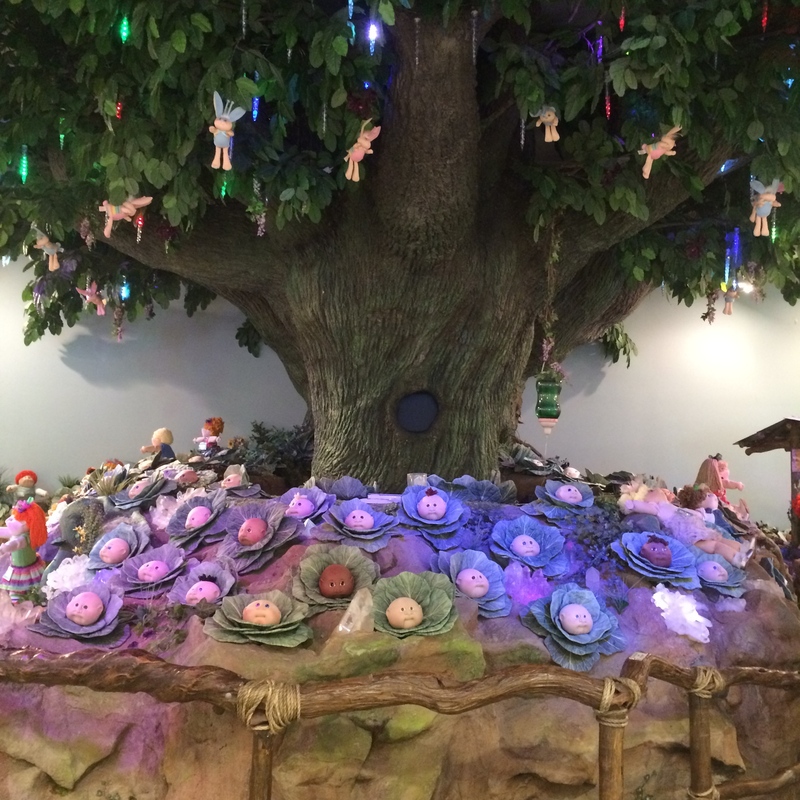 It’s hard to top a Magic Crystal Tree with animatronic babies at its base. Melissa’s daughter pushed to the front of the crowd and watched carefully. I imagine this some how scarred her for life. Melissa’s two year old daughter actually managed to stand still for the duration of the live birth, but she trundled off with her purloined stroller and baby-of-the-moment as soon as we got through “pushing.” As she bustled around the store, bossing babies and giving side eye to a blond girl who stole her chair at the Cabbage Beauty Salon, Melissa scooped up a grinning toddler Cabbage Kid for adoption. “Is that the one she wants?” I asked. Melissa watched in resignation as her daughter abandoned yet another newborn in the clutches of an overstuffed gorilla. Melissa paid the “adoption fee” while I looked for suitable adult souvenirs. Sorry, friends, no shot glasses. But you’re good to go if you want a shot of Imagicillin. Before you get excited, that’s not a fanciful liquor. (Though I suspect they could make some bank if they invested in that.) 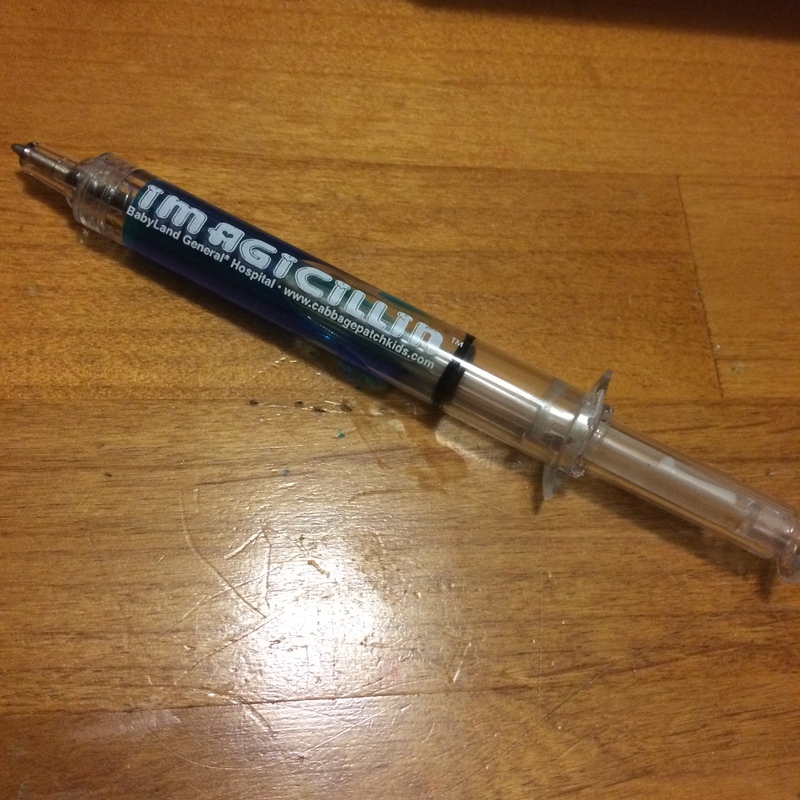 It’s a ballpoint pen designed to look like a syringe filled with the magical drug that “loosens up Mother Cabbage.” I bought two. Here’s one of them. I use it to make my daily To-Do list. In the end, Melissa’s daughter had to be herded into the adoption room, where she repeated the adoption oath back to the nurse on duty. Sensing the importance of the moment, she embraced her new baby, Ruby Jane, for Melissa’s cell phone camera. These modern kids…. they know exactly what to do when you hold up your iPhone. Already, she has the frantic eyes of a woman whose life has changed forever. We left the adoption room, and Melissa’s daughter trailed her baby behind her for a moment before abandoning her completely in favor of a cradle of newborns. Sighing, Melissa leaned down to scoop up the newest member of her family. We headed for the exit. On the way home, we stopped for queso. Basically, it was the perfect day. 2. Back When You Were Easier to Love, by Emily Wing Smith, finished 2/4/14 It was a Valentine surprise! 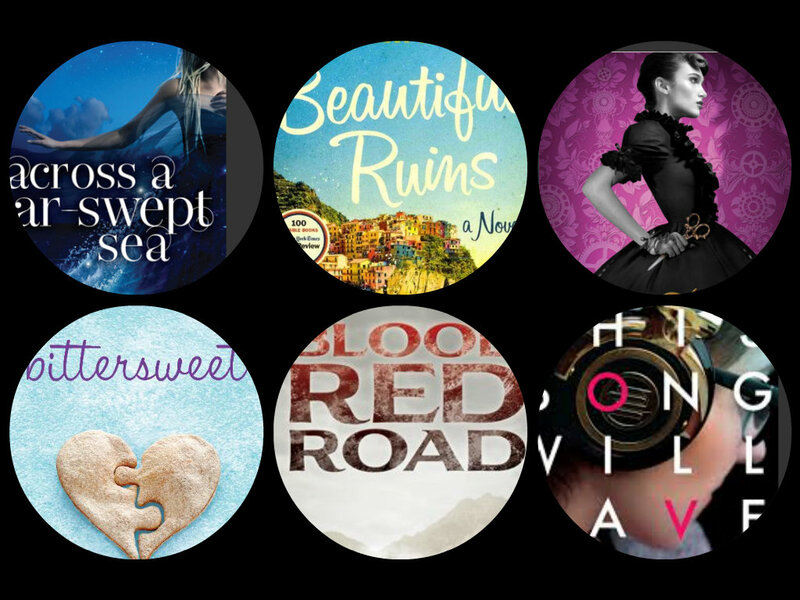 A contemporary YA romance that didn’t make me roll my eyes once! And it was bittersweet because part of it is the heroine realizing her ex-boyfriend is a douche. But his best friend sure is nice and hot and cute and fun. 3. Vampire Academy, by Richelle Mead, finished 2/7/14 I ignored this series for years because I thought it was just another vampire book. Mistake! It’s such fun! And these are a different breed of vampires! And now I want to see the movie! 4. Cress, by Marissa Meyer, finished 2/12/14 Third book of The Lunar Chronicles, a series I just really enjoy. This time it’s a re-telling of Repunzel, and it pokes fun at the Damsel in Distress trope. Capt Thorne is still the greatest, and I’m envious of Meyer’s ability to weave in so many points of view without losing the thread. And I can’t wait for Winter because that Lunar princess she introduces at the end of Cress is CRAZY like a fox. 7. The Incorrigible Children of Ashton Place, by Maryrose Wood, finished 2/28/14 A young governess goes to an old British estate to teach the children…. who were literally raised by wolves. Really delightful and a fun read aloud since the children punctuate most of their sentences with howls of some kind. 8. One More Thing, BJ Novak, finished 2/28/14 I saw him read a few of the stories aloud, and I think audiobook is probably pretty great. Plenty of that signature Office humor- the kind that makes you smile and feel smart, but you don’t actually laugh out loud. Some people get hidden on Facebook because they post incessantly about their children or quizzes that prove they are just like Hermione Granger or controversial political opinions. I’m going to get hidden because I can’t shut up about figure skating. Also because I post dumb stuff about how I want Tostitos, but that’s another story. Ice Nachos are really important to me. Every four years, the mania comes over me like a mental illness that I’ve previously held at bay with medication. But then… the Olympics starts and I’m powerless. All other obsessions fall away. Sorry, novel writing. I’ll come back for you later, Parks and Rec. J K Rowling, I will deal with you and your ridiculous shipping opinions at another time. I have only one love now. I am Bella Swan, consumed by thoughts of my one true love– Edward “Figure Skating” Cullen. He can watch me sleep at night and tell me what to do and drive me around in his stylish Volvo. I’m smitten. But why? I didn’t grow up figure skating– I’m not even sure one could train to be a figure skater in the swamps of Louisiana. And I manage to ignore it for 3 years and 11 months at a time. Furthermore, sports don’t generally appeal to me; I happily forget about the Super Bowl every year. Yet, I find myself gushing about the figure skating hopefuls and the behind the scenes drama every chance I get. My neighbor asked me how I was doing, and I launched into discussing the documentary I saw about Tonya Harding and how it made you look at her and the classist issues of figure skating in a whole new light. My neighbor nodded thoughtfully and asked if I had batteries for my flashlights if the power goes out in the ice storm we’re currently experiencing in Atlanta. A Canadian friend introduced me to the greatest ice-based love story of all time. And there’s your answer. This is why figure skating so consumes me on a quad-annual basis. I’m sitting here watching the pairs figure skating final, and I’m barely looking at my TV screen. The skating is almost the secondary love. What I really love, what I really can’t get enough of, is the backstage drama, the costumes, the thoughtful articles about the social issues that figure skating brings to light, the possible romances amongst the skaters, the epic soundtrack music to which they compete, the clothes that Johnny Weir dons while commentating for NBCSN, the snarky tweets by the figure skating community…. It’s like getting to watch a fantastically over-the-top soap opera that only airs once every 4 years. And I suppose there’s snippets of this available to a willing audience in the three years intervening, but there’s no better pressure cooker for the drama of figure skating than the high stakes of the Olympics. And you only get this high drama in figure skating. None of the other sports in the Winter Olympics seem to inspire this avalanche of commentary. Perhaps it’s because of the artistic side of skating? Or that it’s an historically feminine sport (feminist scholar friends, feel free to weigh in)? 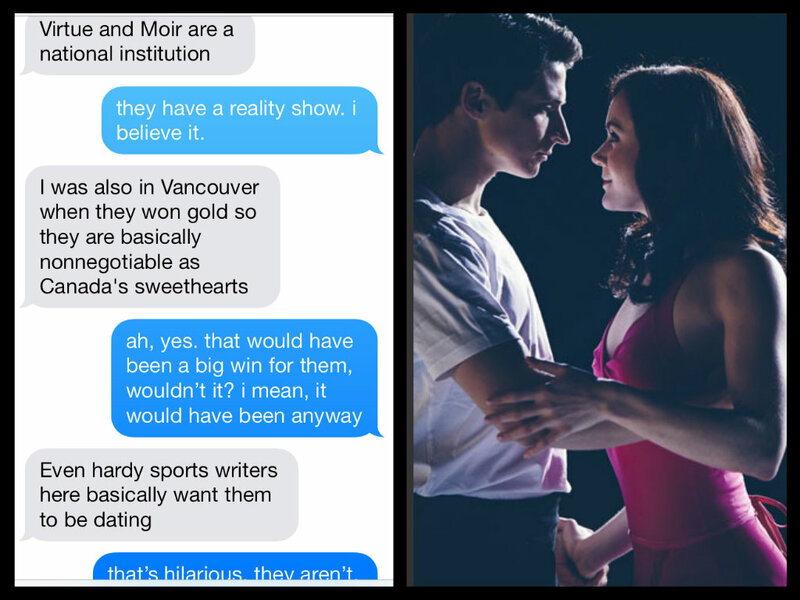 Or maybe we have Nancy Kerrigan and Tonya Harding to thank for our modern day thirst for drama on the ice. They who knew the storm sicken of the calm and all that. If you, like me, need to feed the addiction, here’s some links and assorted online material to sate your hunger for the ice. And I’m planning to write a couple more blogs about the skating this year, so maybe come back for those? 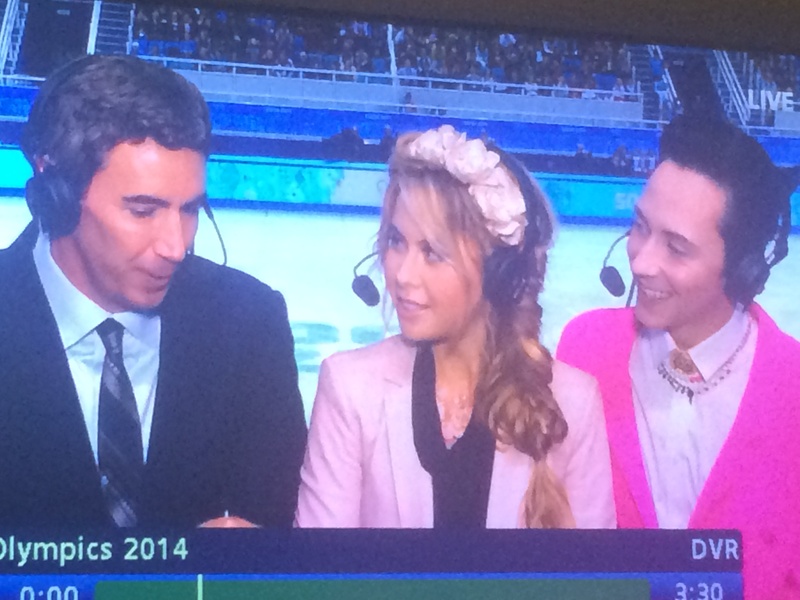 I mean we haven’t even talked enough about my new favorite bromance, Tara Lipinski and Johnny Weir. And dear sweet Midori Ito, we haven’t even scratched the surface on Tessa Virtue and Scott Moir and their rivals from America Meryl Davis and Charlie White. That’s the kind of plot line that is primed and ready for a CW drama. And we Americans have been woefully unaware! Luckily, I have Canadian friends who were all too happy to fill me in on that whole situation. If you’re in the US, you should be DVRing the live competitions while you’re at work– check the listings for NBCSN on your digital cable. If you’re not that invested in your TV, you can stream it online. This is where we get the commentary from fabulous Johnny Weir and Tara Lipinksi, who are egregiously not the commentators NBC utilizes for the edited broadcast version we get during primetime. Just look at what they wore yesterday. NBC, you are dummies for not tapping this gold mine. Weir has a braided pompadour. BRAIDED. And what about that garland, Lipinski? Also, follow Johnny Weir on twitter and instagram for shots of his daily fashion choices. Tara and Johnny also started a joint Instagram that’s worth a look, and Tara’s personal account is fun too. @shutupbuck – Funny but mostly kind commentary on the skating programs. 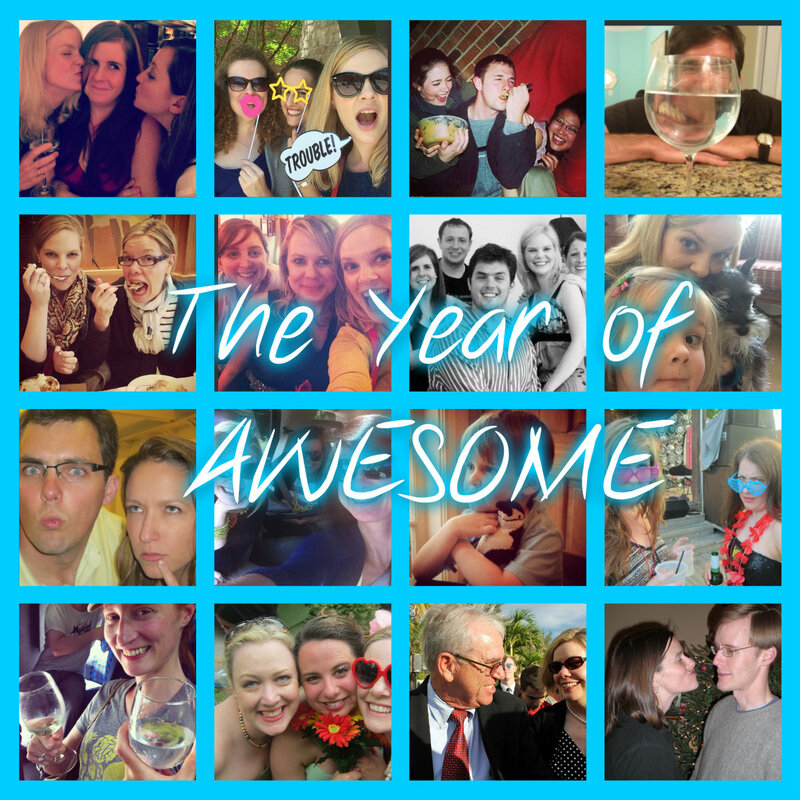 @fuggirls- You probably already know the Fug Girls for their blog Go Fug Yourself. 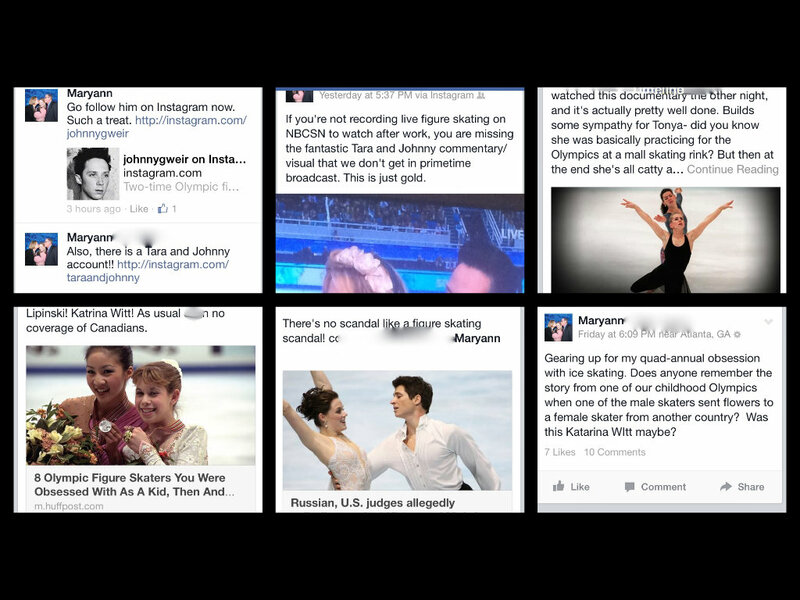 They are also massive figure skating fans with plenty to say about fashion choices and side eye from competitors. Speaking of the Fug Girls, you can plunder their archives for years of figure skating snark. Here’s the most recent one from the US Figure Skating Nationals. Still really interested in Nancy and Tonya 20 years later? This Believer article is a great recap of what really happened. (Thank you to my friend J for pointing me toward it.) The ESPN 30 for 30 series also just aired a fantastic documentary examining Tonya’s side of the story. Maybe you can search ESPN’s listings for the next airing? Or buy it on iTunes? Or do something a little illegal to watch it? And here’s an interview with the director in which she suggests Nancy is convinced Tonya totally knew. And blessed Buzzfeed is the gift that keeps on giving with multiple posts about my new favorite topic. Check back here tomorrow or the next day for a closer look at the competitors, and the stories I’ve made up about them in my head. Spoiler alert: somebody has a non-ironic rattail. First month of 2014 is not off to a great start if I’m hoping to hit that 150 book goal. A combination of stress at work, extracurricular activities, and some book fatigue slowed me down. 1. Aristotle & Dante Discover the Secrets of the Universe, by Benjamin Alire Saenz, finished 1/1/14 Very beautifully written YA, exploring themes of sexuality and friendship and family. Bonus points for featuring Mexican American families in a non-stereotypic but truthful way. Truly unique and believable male narrator. Definitely worthy of all the praise. 2. The Last Lecture, by Randy Pausch, finished 1/3/14 What better way to start the new year than reading a famous inspirational book? 3. The Raven Boys, by Maggie Stiefvater, finished 1/6/14 Great start to a supernatural series set in small town Virginia. 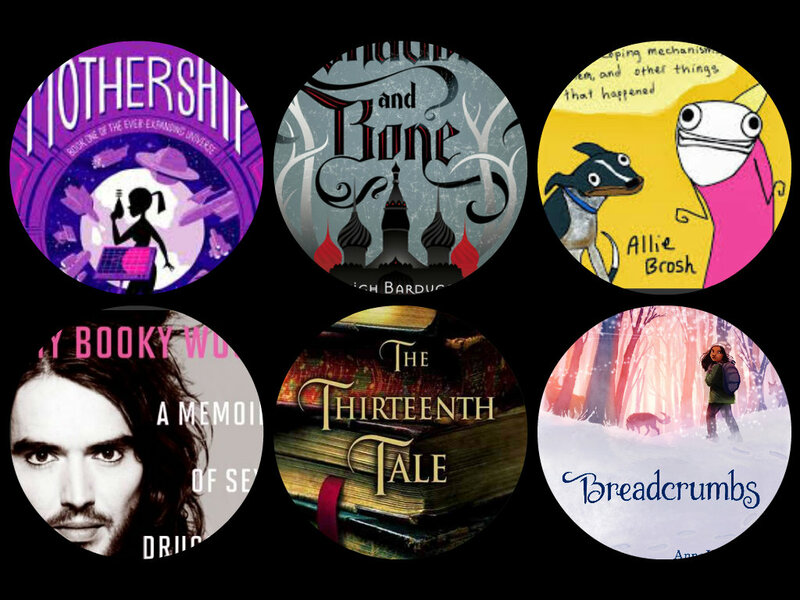 Welsh mythology, psychics, prep school boys, and ghosts, oh my. Love the world building, love the banter amongst the boys, love the slow build romance for heroine Blue, and love the combination of snappy dialogue with grave plot lines. Just really love this. 4. The Dream Thieves, by Maggie Stiefvater, finished 1/21/14 See above. More of the same in the second book of the quartet. Stiefvater manages to avoid the pitfalls of middle-of-the-series books by kicking off new character arcs. I WANT MOAR. 5. Paper Towns, by John Green, finished 1/22/14 Re-read for Book Club. Still has lots of good lines. That clever John Green. 6. Scarlet, by Marissa Meyer, finished 1/27/14 (audiobook) Just listened to the audiobook to prep for the release of the third book in the Lunar Chronicles series, which is released in February. The narrator for these audiobooks is pretty great. If you haven’t started this series yet, I highly suggest it. Some of the best fairytale bending out there. And bring on more Captain Thorne, please! 7. The Bone Season, by Samantha Shannon, finished 1/31/14 You’ve heard of this series, yes? The one where the 21 year old student got the six-figure book deal for a series of seven? Being compared to Harry Potter? After finishing the first book in the series, I can say that comparison is unfair to both authors. A fair warning: this is only like Harry Potter in that there will be seven books, it’s set in Great Britain, and there’s magic. Otherwise, you’re signing up for something completely different. Favorite New Author: Rainbow Rowell. I read her entire canon of books this year, in a manner of months. Also, I saw her speak at my local indie book shop, and she’s as funny and real and friendly as you want her to be. I’ll read anything she writes, forever more. For 2014, I have an unread book list that is fairly intimidating (over 90- gulp! ), but I’m working on giving myself “book amnesty” and only reading books that I really want to read. My goal is to hit 150 and to throw in some more literary fiction to up my brain game. What do you think I should read, faceless Internet void? What were your favorites from the last year? 1. Skybreaker, by Kenneth Oppel, finished 12/1/13 Second Matt Cruse book. This time with a treasure lost in space! Sometimes, this series takes on the feel of a serialized British children’s program that one might find on PBS or BBC America. Or maybe like The Goonies meets steampunk meets Romancing the Stone? 2. Starclimber, by Kenneth Oppel, finished 12/10/13 The final Matt Cruse adventure (so far?). Good finish to a swashbuckling series! 4. Beautiful Ruins, by Jess Walter, (audiobook), finished 12/14/13 Engrossing story crossing generations and oceans to tell the story of a sickly actress and an Italian hotel owner. Great voice actor on this one– aces with multiple kinds of accents and soothing to the ear. There were times when I turned on the audiobook while hanging out in my condo just because I wanted to keep listening to the story. Kind of wish I’d read this one on paper. 5. Blood Red Road, by Moira Young, (audiobook), finished 12/21/13 Yeesh, but this is a dark one. I feel kind of like Stefan from SNL as I describe it. 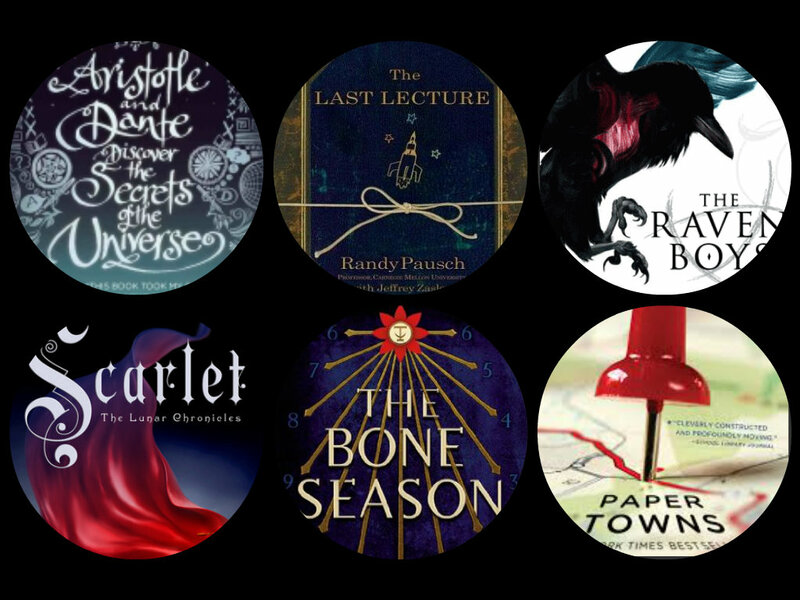 This post apocalyptic YA has everything: cage fights, deluded dictators imitating Louis XIV, a pack of quasi-Amazonian teen girls seeking to liberate a corrupt city, and magical heart’s desire necklaces that really work. Every time you think the heroine has hit rock bottom, something else really awful happens. It really is a blood red row to hoe. 6. Across a Star-Swept Sea, by Diana Peterfreund, finished 12/21/13 Sequel to the great For Darkness Shows the Stars. Fun science laced re-telling of The Scarlet Pimpernel. Dug the world building and the secret spy stuff. 7. Etiquette & Espionage, by Gail Carriger, finished 12/26/13 Steampunk Victorian finishing school for teen girl assassins! What could go wrong?! 10. Cinder, by Marissa Meyer, (re-read), (audiobook), finished 12/29/13 Just had to snap up this audiobook when I saw it as a travel deal on iTunes. Listened as prep for the forthcoming third book in the Lunar Chronicles trilogy, Cress. Excellent female narrator on this one! 11. Bittersweet, by Sarah Ockler, finished 12/31/13 Uh– cupcakes, figure skating, a losing boys’ hockey team, a cutesy diner, and snowstorms. This book is basically a great teen movie. Upbeat way to finish out the year of reading! 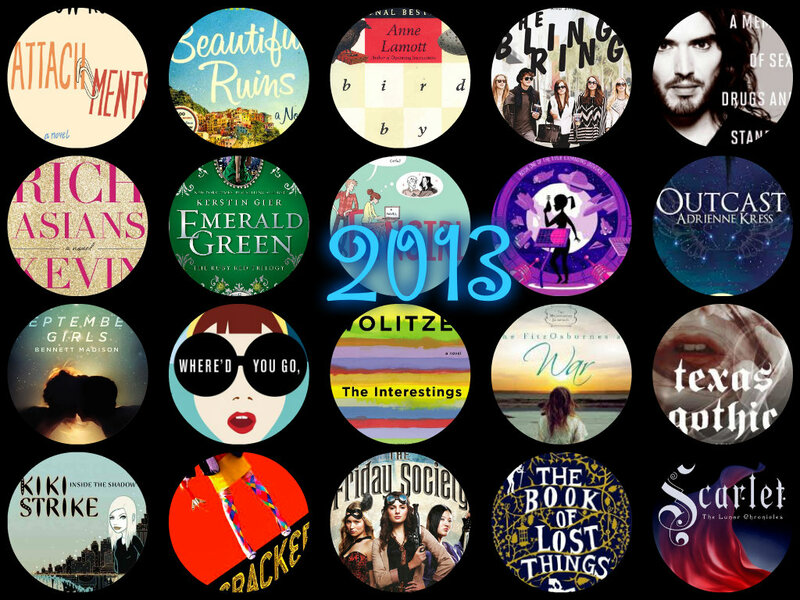 Total Books Read in 2013: 144! 1. Grave Mercy, by Robin LaFevers, finished 11/1/13 Dark revisionist history of late 1400s Brittany in which a convent trains the progeny of Death (a god of some kind?) to be assassins. Our heroine has some special gifts that take her to the court of Anne of Brittany… and straight into the arms of a hot romance. Ha cha cha. 2. Mothership, by Martin Leicht & Isla Neal, finished 11/3/13 This one could have gone either way– in the future, a group of pregnant teenage girls are sent to live on a spaceship orbiting earth. Get it…. MOTHERship? The pun is so great, you have to try the book; but you know it’s a risk. The good news is that the risk pays off, and the whole book is as delightfully funny as the title. In discussion with my male cousin about this book, we agreed it’s a crying shame that the sequel is not called Fatherland. 3. My Booky Wook, by Russell Brand, finished 11/5/13 A legitimately good memoir. My friend J says that it sounds like an erudite English gentleman is politely commenting on the rascally antics of his raunchy alter-ego, and that’s about right. Brand writes frankly but also humorously about addiction, and he gives all the gory details of his debaucherous early life. Surprisingly great. 4. Booky Wook 2: This Time It’s Personal, finished 11/7/13 More of the witty prose of My Booky Wook, but with a coda about Katy Perry that will make you feel unreasonably sad that the pair of them didn’t end up working. 5. 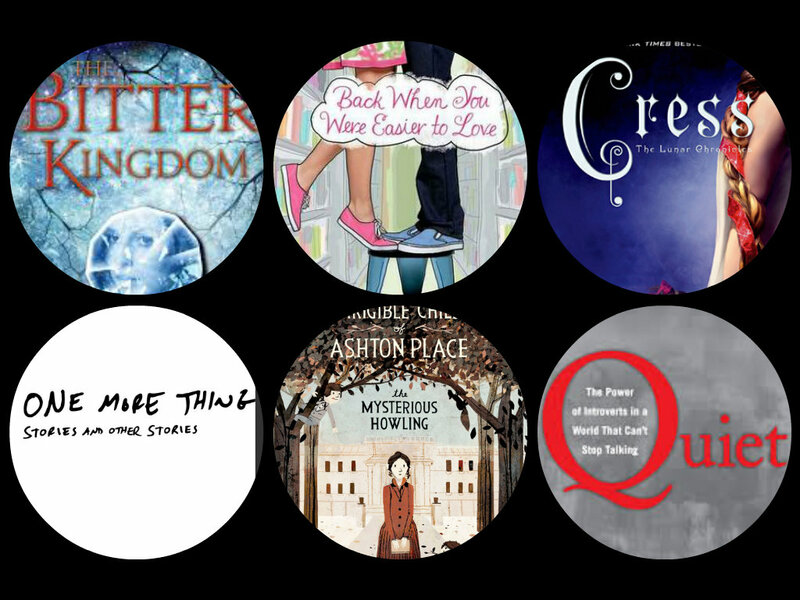 Fierce Reads, by various authors, finished 11/8/13 A collection of short stories written by YA authors signed under the Fierce Reads imprint of Macmillan Publishing. You can download it for free from your favorite ebook retailer! I picked it up for the sake of the prequel to Marissa Meyer’s Lunar Chronicles (such a good series, y’all! ), but it also turned me on to the fantastic Leigh Bardugo with her short story, “The Witch of Duva.” In fact, I picked up the first book in her Grisha Trilogy after reading it. It’s a free download, so you really can’t lose. 6 . Shadow and Bone, by Leigh Bardugo, finished 11/11/13 Seriously good start to an epic magical trilogy taking place in some kind of alternate universe Russia where some men and women known as Grisha can command the elements. Raised in an orphanage, Alina shows some early signs of Grisha ability, but she stomps down on her powers when they threaten to separate her from her best friend Mal. When they both serve in the army, her powers come to the forefront again when she catches the notice of the sinister Darkling. Alina is swept into the glittering world of the Grisha– and away from Mal. Great world-building and page-turning writing. 7. The Willoughbys, by Lois Lowry, finished 11/11/13 Lois Lowry just writes a little of everything, doesn’t she? Here she writes a gentle parody of all the literary tropes found in “old-fashioned” children’s literature: incorrigible children, the dotty nanny, the baby left on the doorstep, the reclusive wealthy man, and so forth. Quick and fun, but possibly more amusing for the adults reading it to their kids than to the actual kids. Hard to say since I am no longer a kid and have limited access to kids. 8. Breadcrumbs, by Anne Ursu, finished 11/12/13 Lovely re-telling of the Snow Queen that also ruminates on the struggles of transitioning from childhood to adulthood. Hazel and Jack are BFFs…. until Jack just shuts down on Hazel. Maybe there’s an ice chip in his heart and he’s been taken by the Snow Queen, but maybe they’re just growing up. Regardless, Hazel is bravely facing the magical snowy woods to save her friend. Some really wonderful lines about reading and childhood and life. Beautiful illustrations too. 9. Siege and Storm, by Leigh Bardugo, finished 11/13/13 Sequel to Shadow and Bone. Alina and Mal are on the run from the Darkling and his scary new abilities, all while Alina is still learning to control her newly discovered powers. A good example of a sequel that manages to move along the story without getting stuck in the boring middle ground. 10. Hyperbole and a Half, by Allie Brosh, finished 11/14/13 Allegedly, this collection of Allie Brosh’s greatest hits from her identically titled blog also features some new content, butI didn’t notice it. I’ve read several of her essays/comics more than once, and they still make me laugh out loud. And did you listen to her interview with Terry Gross in which Terry Gross boldly asked about her suicide plan? Damn, Terry. I’m a crisis counselor in my real life, and I don’t even ask that question so casually. 11. The Thirteenth Tale, by Diane Setterfield, finished 11/18/13 A gothic style mystery for all the book lovers out there. Reclusive beloved writer Vida Winter contacts quiet Margaret Lea to write her true biography– significant because she’s given so many false stories to reporters over the years. While it is a twisty mystery story, it’s also a love letter to books and the power of stories. I highlighted many sections in this one. 12. Airborn, by Kenneth Oppel, finished 11/27/13 First entry in the Matt Cruse books. Another alternate universe story with a steampunk vibe in which we use Zeppelins for air travel. Matt loves to fly, and he’s embarking on an unforgettable journey on his home, the Aurora. 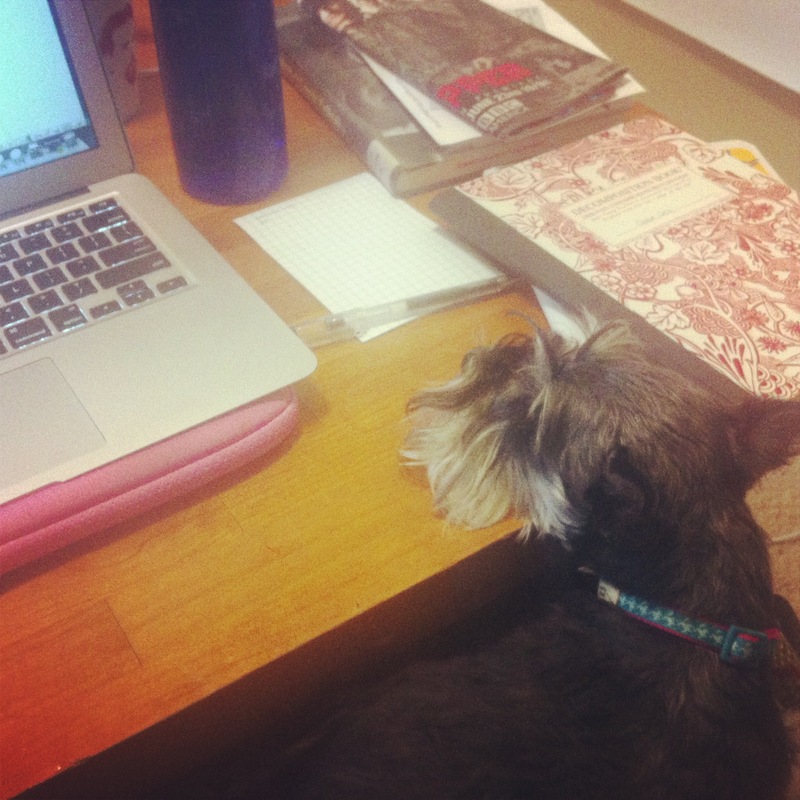 Also on board- spunky, burgeoning scientist Kate. In a YA landscape packed with doomed romance and supernatural whatevers, it’s a refreshing story with high adventure and scientific discovery.